On July 10th, Wellmont, Strongwell and five other leading employers formed a new partnership to increase the well-being of our communities. 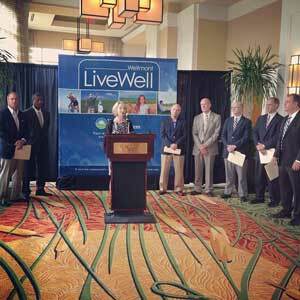 The new program, Wellmont LiveWell, was unveiled as a free community health transformation initiative to empower employers and employees to commit to healthy habits which include: proper exercise, nutrition and maintaining blood pressure, cholesterol and blood sugar levels. Representatives from Wellmont, Strongwell, Eastman Chemical Company, Food City, Alpha Natural Resources, DOMTAR Paper Company LLC, and Electro- Mechanical Corporation forged their vital partnership at the Meadowview Conference Resort and Convention Center to promote prevention above treatment. Registration and participation is free to all at www.wellmont.org. Every participant may opt in to receive personalized information on a variety of health topics, research the extensive health library, join local health events and take a free health assessment.